God rescued me in 1984. In a drug-induced vision I saw things that no mother wants to see. I bargained with God that night and I made a vow (a vow I have never broken) and the next day, The Rescuer proved Himself strong and faithful to me, insignificant me. In 2007 the Lord used me to rescue my daughter (the story is way too long to write here, but can be found here on my blog, titled, “The Origin of My Hope.” I was the human instrument in the rescue, but soon after, The Rescuer came and changed her life forever. 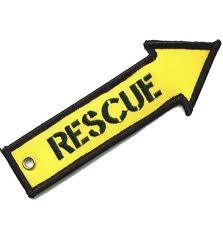 Currently I am in rescue mode again – a son this time around. I wait for The Rescuer with hopefulness and a sure faith that He will come. My daughter and her husband have rescued our granddaughter, and offered her a second chance and a change of environment and a new high school for a new beginning after a year of freefalling. There are opportunities to rescue all around us. One of the things I love about Facebook is reading about all those involved in rescuing. I have a kindred spirit in Kentucky who is involved in ministry with the homeless of her city – they started rescuing with the gift of a blanket and a warm meal. Many of these people have met The Rescuer through Kris and her husband. I’d love to hear your story of rescue! If not here on earth, we will sip tea together on our porches in heaven. Always a good read Susan….we are coming down 81 from a few days above the Mason Dixon….so when I saw your blog I had to read it….read it to Steve too. Good stuff…. I am in the process of being rescued by the Rescuer and lots of others in Celebrate Recovery at my church Christ Fellowship here in Royal Palm Beach, FL. What would I have done without the Rescuer? There is not a doubt in my mind — I would not be here. With no hope, and no HOPE, I would have given up.. BUT I have the HOPE, and lots of hope, and my Jeremiah 29:11 still exists and my HOPE still has a plan and purpose for my life and I am excited. Perhaps I will change my name: I am a hopeful, HOPE lover, HOPEFL! Thank you Sister! Miss you. Thank you for rescuing me in 2007 and never giving up on Hope!! I am forever grateful to Jesus for always being my Rescuer!! My heart aches for those whose hands are bound and are unwilling to let go and let Love in.